President Goodluck Jonathan has ordered the replacement of a Nigerian Air Force, NAF, helicopter that crashed in the south of Bama in Borno State. The military helicopter, NAF Mi-35, with three-crew members, crashed Monday afternoon, killing the pilot, Flight Lieutenant Nwakile. However, the Co-pilot N.M Halilu, a Flight Lieutenant and technician, and Augustine Nwanonenyi, a Warrant Officer, survived the crash after initial fears that only person survived. While receiving the survivors, the Chief of Air Staff, Air Marshal Adesola Amosu, said that the president had ordered an immediate replacement of the crashed helicopter. Amosu asked the officers not to be deterred in their service to Nigeria, stating that President Jonathan is committed to providing all necessary hardware the military needs in combating the insurgency. He also paid a condolence visit to the family of Mr. Nwakile, who died in the crash. He assured them of the support of Government and the Nigerian Air Force. Thanking God for the lives of the survivors, the CAS also commended them for their gallantry and commiserated with them on the loss of their colleague. He said that the Air Force would do everything to sustain the current synergy between the Air Force and the Army as a sure approach to win the war against terrorism. 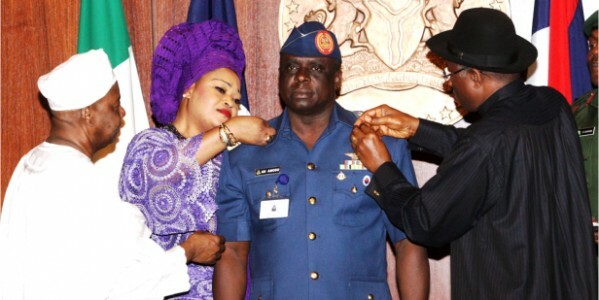 Air Marshal Amosu also enjoined all service personnel to continue to give selfless sacrifice for the defence of the sovereignty of the nation despite the enormity of current security challenges.